Chicago Review Press, 9781613747841, 224pp. If you’re a girl, you should strive to look like the model on the cover of a magazine. If you’re a boy, you should play sports and be good at them. If you’re smart, you should immediately go to college after high school, and get a job that makes you rich. Above all, be normal. Wrong, say 35 leading middle grade and young adult authors. Growing up is challenging enough; it doesn’t have to be complicated by convoluted, outdated, or even cruel rules, both spoken and unspoken. Parents, peers, teachers, the media, and the rest of society sometimes have impossible expectations of teenagers. 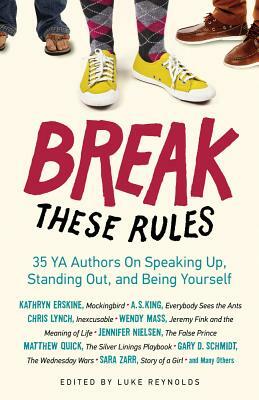 These restrictions can limit creativity, break spirits, and demand that teens sacrifice personality for popularity.